Online sales powered by Paypal. To order parts by phone, or for questions call (530) 365-6561. The Stage II Kit is designed for cars that have more then 650HP. It include different truckarms and a different shock and spring package. Functionally the two kits are the same. Includes shocks, springs, and hardware. Includes shocks, springs, and hardware. Mini-Tubs add $200. Our front kits are engineered to work with our CenterDrive Kits. Increased stopping power of disk brakes and superior suspension geometry. The perfect match for our CenterDrive Kit. A balanced shock, spring, and sway bar package. We can provide solutions for all of your braking needs. 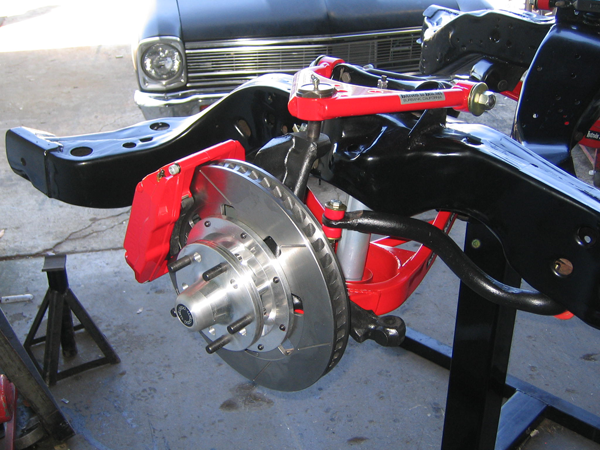 Our Corvette rear brake kit incorporates an internal drum parking break with PBR calipers. The Ultimate front end kit for GM A-bodies. Upper and lower control arms, spindles, and massive Wilwood brakes. 13 inch Wilwood brake kit for f-body and b-body spindles. The ultimate in brake setups for your car. Breaking an axle will not cause you to loose a wheel with this setup. Bring the ultimate circle track and road course rearend to your car. Made in 9-inch, 12-bolt, 10-bolt, and Dana. Excepts 5x4 1/2, 5x4 3/4, 5x5 bolt circles. Our local customers have been benefiting from our prepared chassis for years, now we ship them anywhere. A truly bolt in CenterDrive Kit. Send us you chassis or have us pick one up for you. Making your own rear suspension? Now you have the benefit of using exclusive HTH parts. Will fit most rearends. 12-bolt, 10-bolt, Dana, 9-inch. Driven with a 7/8 wrench. One full set of inners and outers. High quality steel 3/4" heims and lightweight construction. Specify desired length when ordering. Show off your Hotrod even when you are not in it.